﻿I was recently in Texas visiting four of my munchkins(and their parents:)), and while I was there we had a tiny treats tea party! The kids helped with the prep and the set up, as did my daughter (their mom), and we all had a fun time! The treats were fashioned from a book: American Girl tiny treats. I first was introduced to the book via a pin on Pinterest, which led to this post, and the book! I was instantly charmed by all of the teeny treats. I let the kids each pick something to make and we ended up with cinnamon rolls, s'mores, croissants, donuts and pizza. This tea party was for boys (well, one anyway) too. Jake picked pizza to make, and sure enjoyed himself. He even made an appearance as Ironman:). Karaline donned proper tea party attire before she made an appearance. She did a great job on the name tags at the place settings and setting the table too! Happy 7th Birthday today, sweet Karaline! We love you! XO! 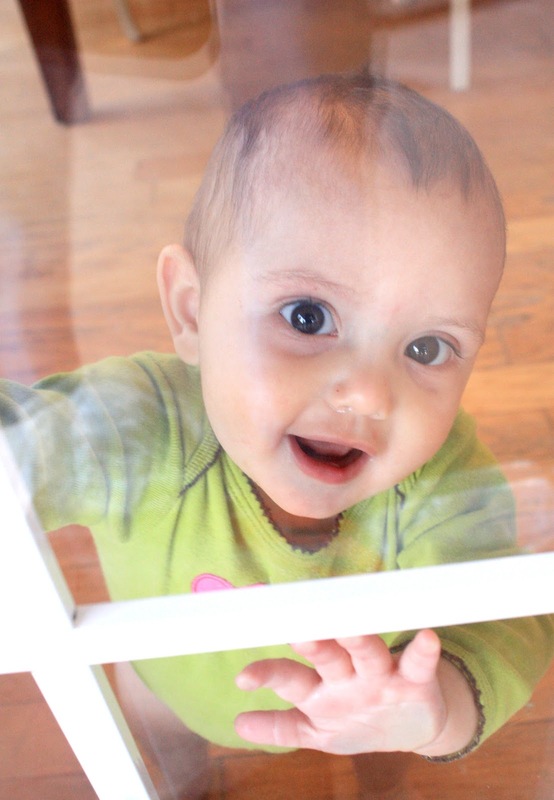 ﻿Little Addy was napping during the tea party, but here she is peeking outside at her siblings jumping on the trampoline. Hi Cutie! The micro mini croissants up close. The croissants are made using Pillsbury crescent rolls. Simply roll out and cut one large triangle into small (2-inch at wide end) triangles using a pizza wheel. Roll each small triangle up starting at the wide end. When done rolling, curve down the two ends. VOILA, a micro-mini croissant! Bake for 8 minutes at 375 degrees. All the treats are very quick and easy to make. At our next tea party we're going to make cakes! 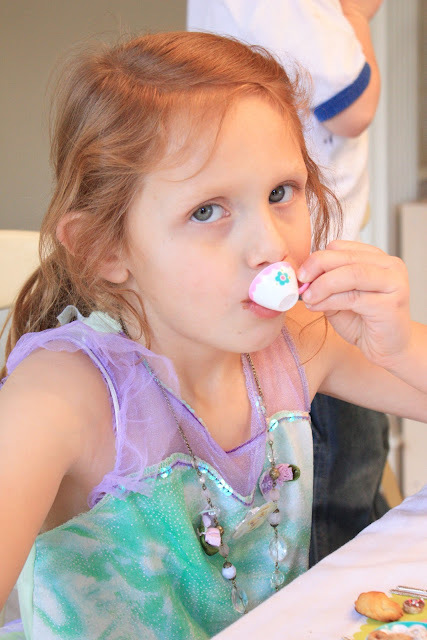 Tiny tea parties produce BIG time fun! What a darling idea. I have never seen this before! You must be the most fun Grandma in the world. Your most adorable post yet! Absolutely love the idea of tea parties, let alone a mini one! 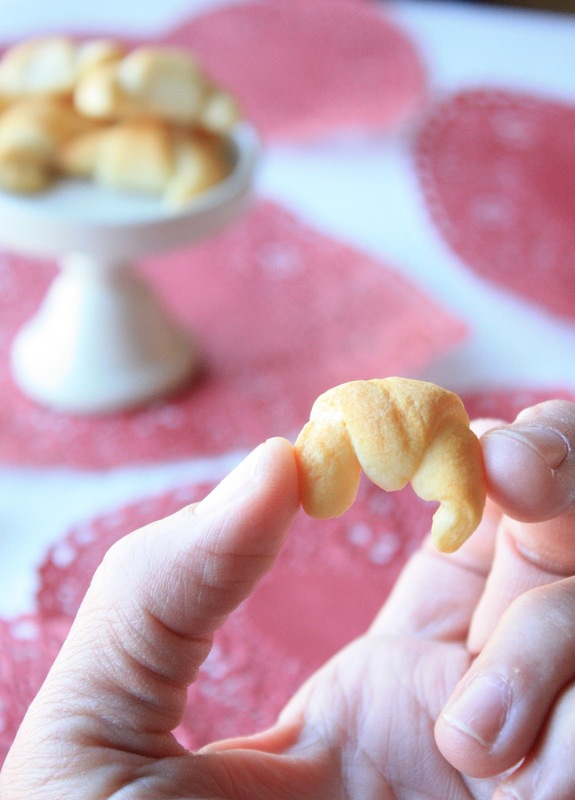 "micro mini croissants"... *dies*. So sweet! You're header picture is absoultely awesome! Just found your blod and Love it! What fun you and the children had and those tiny treats are adorable. This is the first I've heard of this book and I know my grandkids would love it. Thank you! Ah! 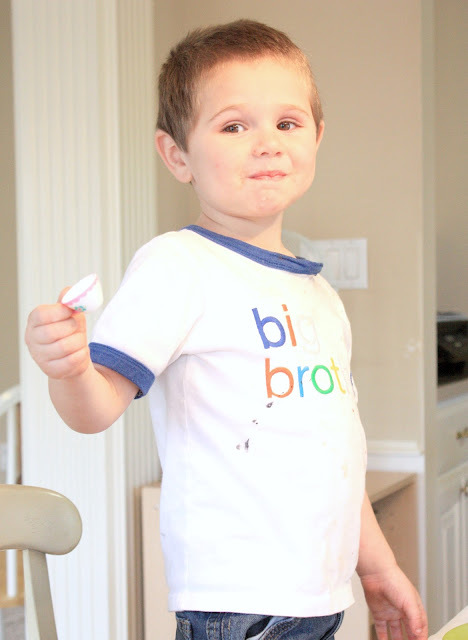 Your munchkins are so adorable! How fun for them and for you. We made the donuts a little while ago and I can only imagine how much my kids would love making all the other fun micro treats. Thank you for sharing your ideas and your sweet pictures. This is beyond adorable! 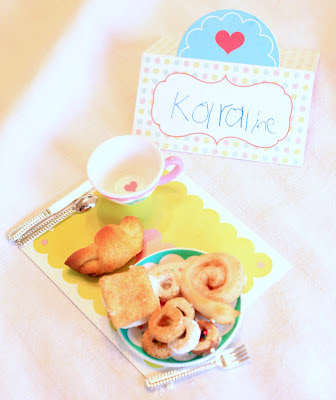 The mini cinnamon rolls and croissants are just precious! You are the ultimate grandma! Happy belated birthday to Karaline! Awww.... love those tiny treats... and how much fun, to share them with your lovelies! Love!!! Especially the mini croissant! And it was with your munchkins! These are fabulous!! It looks like a great tea party!! So adorable. What beautiful children! So much fun! I thought they were different kinds of cereals at first- amazed that you actually baked mini cinnamon rolls! It must come as NO shock that I nearly squealed like a little girl when I saw this post - mini TEA PARTY treats! 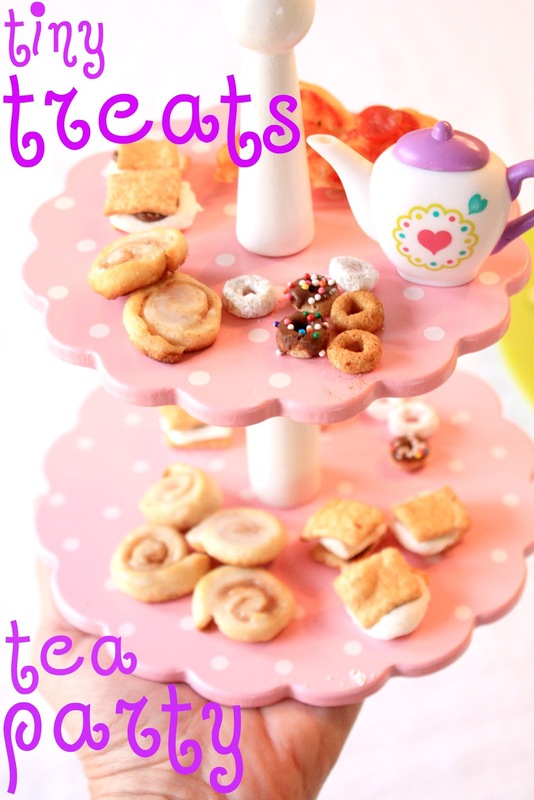 Well this is the cutest idea and perfect for my love of tea parties and for sure will Sophia and I be inviting Polly Pocket on Sunday for a mini treat party - we are excited so thanks. This is adorable! I haven't visited for awhile and have missed all of your cute cookies and treats. Everything you do is always enjoyable an fun to see. Thanks! thanks for saying hi on my blog! the cinn rolls, and ALL of it...is SO TINY! I don't suppose you're one of those people who laces up Barbie shoes or sews clothes for Barbies, are you? 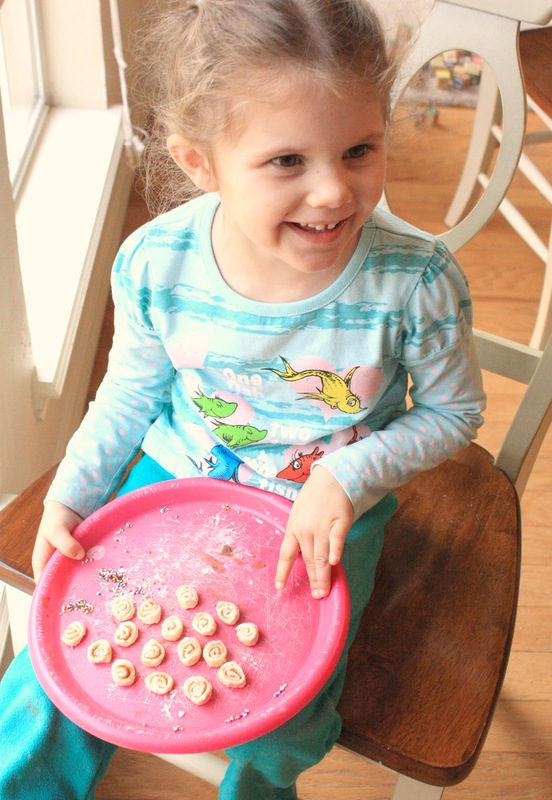 :) The fine motor skill on these treats is amazing! Super cute idea. I love all these mini treats, specially the mini crossaints. Oh your munchkins are just so adorable! It looks like you had a great time! Those tiny little sweets look so fun! Thanks for sharing! Wow, these are just awesome. How cute are these miniature bites, I love them. They just have a massive cute factor for such small items, hehe. I hope you don't mind me stopping by, subbing and commenting every now and again? It's always nice to meet new friends with the same interests. I've just started out in the world of baking myself. I love finding new blogs like yours to stop by, chat, and be inspired by great talent (which you certainly have). How fun! We have that book too and my daughter LOVES it! Miniature food is just so much fun! Happy 7th birthday to Karaline and what a fun party! I bet they just loved the cute cute mini tea foods! Your little child size stacked server is adorable. What beautiful eyes they all have! How fun grandma! Your Munchins are PRECIOUS! And those tiny treats... too cute! The mini croissants are to die for! You are a perfect grandma! Those are soooo cute! You're so clever. Hugs! Tiny = Awesome! Loved this so much.